Bundled in sweats and blankets, I'm trying to avoid using the old furnace if I don't have to. But it's cold here in front of the window where I write. And I feel like writing for a change! Most of the time I'm so busy I don't notice the cold....or I go out and walk or rake leaves as it's often warmer outside than in. The small tree is up and trimmed and there are three light-up decorations in the yard. That is enough. Three grandkids here every weekend mean each can play a role in getting this Grandma-only house ready for Christmas. Carrying the tree in and setting it up; getting the boxes down from the attic, choosing favorite ornaments and which yard stuff to use, playing the holiday music boxes over and over.....at the same time! 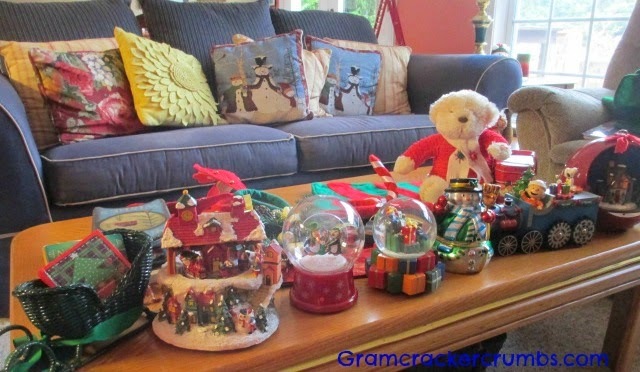 They love this collection that grew each year from after-Christmas sales; something Grandpa was really good at! This second Christmas without my husband has been so much harder. Losing him was still too fresh in my head last year; I still operated on the momentum that had carried me through two services and helped me maintain every routine and tradition through Halloween and Thanksgiving and the kids' Birthdays and then....Christmas. My daughter insisted I spend the night at her house; sharing that Big Day with her in-laws; once solely their domain. This year has been full of positive change and growth; finding my independence and some kind of forward path. But it's still hard. Cold, rainy weather dampened our annual cul-de-sac's sit-outside-with-neighbors Halloween celebration, so I got a pass on that. With the exception of maybe two or three out of 47 years, my husband stuffed the turkey and cooked the whole Thanksgiving meal every year in all our homes. This year my daughter hosted it at her house. And this year, I'm heading to my son's for Christmas....to his home on the beach in California. Yeah, big changes. And I am okay with this. Together we are showing the kids and ourselves that it can become different while keeping him very much alive in our hearts. We used to call the beach town where our older granddaughters live our second home. We went for months at a time; keeping tubs of clothes, our bikes and an old classic car in storage till next time we arrived. Less than a month after he died, I hopped on a plane to CA to walk the beach. I rode my bike down our favorite palm tree-canopied streets and along the boardwalk all the way down to Surfer's Point. Funny how I could feel him beside me; I usually rode fast so stayed ahead of him; other times he'd have had enough and head back first. It's been 15 months since I've been back. Apparently I've missed so much. We knew the neighbors around our beach rental; participated in community events, volunteered at the girls' schools, belonged to the library and the local old-car group. Now the Pacific Coast Highway is blocked by mudslides, (meaning Hwy 101 on my ride from the airport....yikes!) and local seaside restaurants are either closed for the season or undergoing renovations (from weathered charm to shiny new does not appeal.) Some of our favorite pals have either moved or gone away for the holidays; sure wish things could always stay the same. But it will all be good....the best thing in the world to see my family and share in their traditions and plans. Both teenagers still want to bake and decorate Christmas cookies. They'll ride bikes with me and my son's idea of entertainment is to walk along the keys and see the light displays on all the boats! 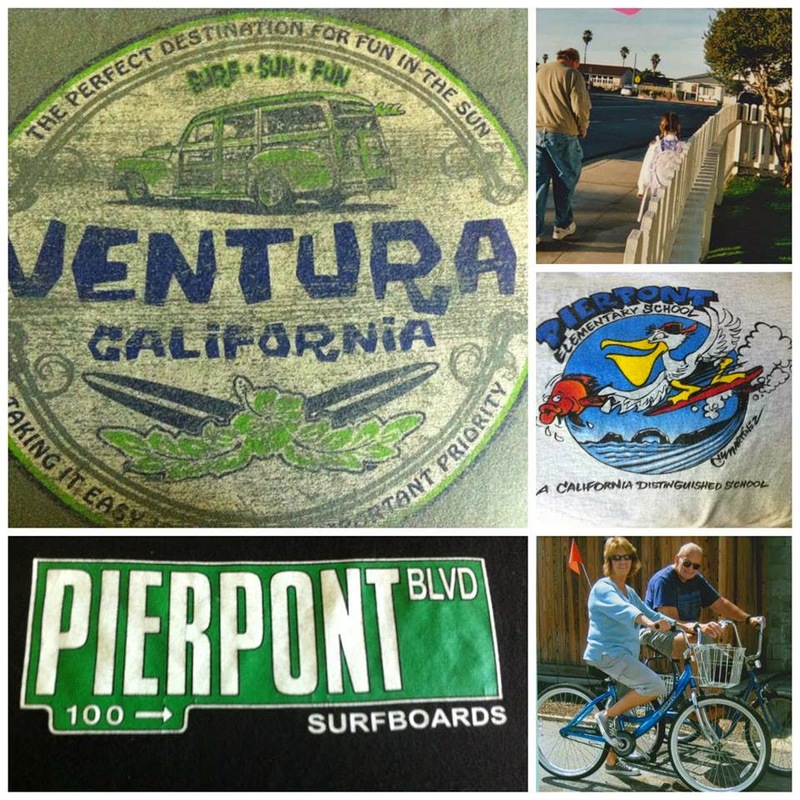 A beachy Christmas and lots of good memories here! I've had some great days,weeks and months this past year on my own. Unexpected and different, but in mostly good ways. Now as December winds down and I welcome 2015 with my California kids, I accept things being different, things changing and that things become as they are meant to be. I do so admire you, Joan. If I lost Grandma B I think I would just crawl into a corner (or a bottle) and never come out. You have just soldiered on, writing about your pain without wallowing in it and providing inspiration to all your readers. Bless you. Thank you Bob. It's how I'm wired......or how he loved me and equipped me to carry on I guess. That and having grandkids make you stronger than you know! Blessings for you and your family this holiday season. I am on my way to Florida, my second Christmas without my Mike. I had just recently remarked to a friend that the "seconds" have seemed harder in a way than the "firsts" so I know what you mean. I think there was a numbing effect in play the first time around, but now reality has set in. But it is incentive to keep moving forward in a way as well. Enjoy the memories and make new ones. Thank you for understanding, Olga...I hope you'll be surrounded by friends and family this Christmas. And when we smile and enjoy it all with others, it adds another layer of strength and faith to keep going. An opportunity to make new memories, while honoring the old. Yes. Thanks Carol.....and an opportunity to engage in the now so I won't think about the past! I hope every day gets a little easier. Have a happy holiday in California. Thanks Rena. I'm planning on it! Enjoy your holidays too...and those new precious baby dolls! Hey, Kc....I read your message but messed up somehow clicking publish! It looks like the weather will be clearing and sunny enough to ride my bike most days! Thanks for always thinking of me. Hugs and have great fun with Amara!